Yu, V., Sharma, D., Murty, K. (2008). Door Allocations to Origins and Destinations at Less-than-Truckload Trucking Terminals. Journal of Industrial and Systems Engineering, 2(1), 1-15. Vincent F. Yu; Dushyant Sharma; Katta G. Murty. "Door Allocations to Origins and Destinations at Less-than-Truckload Trucking Terminals". 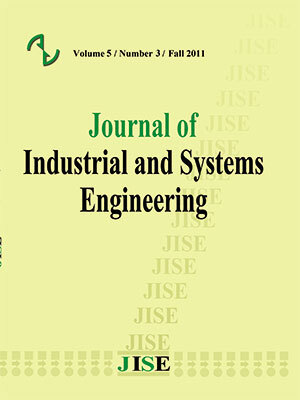 Journal of Industrial and Systems Engineering, 2, 1, 2008, 1-15. Yu, V., Sharma, D., Murty, K. (2008). 'Door Allocations to Origins and Destinations at Less-than-Truckload Trucking Terminals', Journal of Industrial and Systems Engineering, 2(1), pp. 1-15. Yu, V., Sharma, D., Murty, K. Door Allocations to Origins and Destinations at Less-than-Truckload Trucking Terminals. Journal of Industrial and Systems Engineering, 2008; 2(1): 1-15. For an LTL (Less-than Truckload) carrier, the allocation of doors at a consolidation facility to outbound trailers assigned to various destinations, and to inbound trailers in the continuous stream arriving from various origins, has a significant impact on its operations, and on the nightly man-hours needed for consolidation. In the past literature door allocations to destinations of outbound trailers are determined using deterministic mathematical models based on average volumes of shipments between origin-destination pairs. The online nature of allocation of doors to inbound trailers is either ignored or simple rules like FCFS (First Come First Served) are assumed that do not take advantage of the data on the trailer's actual contents readily available at the time of its arrival. In reality the actual shipment volume between any origin-destination pair varies significantly from day to day. Due to this wide variation destination door allocations that are optimal for the average volume tend to be far from optimum for most nights. Also, very simple on-line policies for door allocation to each inbound truck at the time of its arrival based on its actual contents can significantly reduce the man-hours needed to consolidate its contents. In this paper we develop a new model that uses such an on-line policy for door allocations to inbound trailers, and determines doors to allocate to destinations to minimize the expected man-hours for consolidating freight nightly taking the random variation in freight volumes into account. Computational results on data from an actual facility indicate that the man-hour requirement can be reduced by over 20% compared to current practice. Ahuja R.K., Magnanti T.L., Orlin J.B. (1993), Network Flows: Theory, Algorithms, and Applications. problem; Computers and Operations Research 27; 917-934.
assignment; In Proceedings of the 2000 Industrial Engineering Research Conference; Cleveland, Ohio. Bureau of Transportation Statistics, USA (2003), National transportation statistics. Davis L. (1991), Handbook of Genetic Algorithms; Van Nostrand, New York. Shipments; Ph.D. thesis, University of Illinois at Urbana-Champaign. Savage S., Scholtes S., Zweidler D. (2006), Probability management; ORMS Today 33(1); 20-28.